We are a leading Wholesale Trader of panel saw, altendorf automatic panel saw, altendorf panel saw and scm panel saw from Mumbai, India. Smooth operation motion guaranteed overtime by the system of sliding bearings running on hardened steel guides using an exclusive method of mechanical fixing. Torsional rigidity and total absence of vibration through the closed loop structure of the saw unit which ensures perfect alignment of the blades. "Ready": the practical advantage for automatic control of the main positions. Programming of the work simple and effective with the electronic control (programmed version). Manual movements: always user-friendly and precise. Every minimum hand wheel movement corresponds to a precise blade adjustment (manual version). 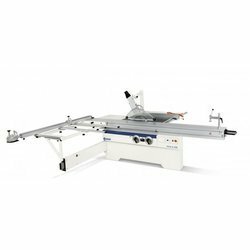 Number one for ease of operation and ergonomics the eye-level control panel of the Automatic Panel Saw WA8X panel saw can be pivoted to the most convenient position for the operator. The panel displays saw-blade angle and rip fence position as a digital display with entry via a convenient keypad. The time saving motorized rip fence provides accuracy and increased productivity making it the ideal saw for those with little time to spare. If you’re looking for a machine which is robust, ready for the anything and easy to operate, you’re right on target with the Altendorf Panel Saw WA8T. Whether you’re squaring panels or cutting complex angles and miters, the Altendorf WA8 is the right companion for you. 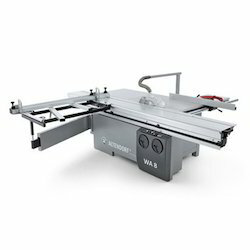 Manufactured to Altendorf’s rigorous technological standards, the WA 8 entices with its solid build quality and ergonomic flexibility. As soon as you have one, you’ll wonder how you ever managed without one. That’s what happens when you decide to invest in the high quality only the world market leader can provide. This SCM Panel Saw offers a 16-inch blade capacity making the machine one of our most versatile. It has heavy features and fast-growing shops will appreciate the ease of use and production capabilities. It has a new, wider, sliding table with two channels for added versatility. It has a massive cast-iron blade group which tilts on a trunnion mechanism. This closed system allows for maximum dust removal and is the most durable tilting design. The entire blade group raises and lowers on two steel columns, and the gear assemblies are encased in a patented mechanism which doesn’t allow dust or pitch to penetrate the joining mechanism. Always user-friendly and precise. Every minimum handwheel movement corresponds to a precise blade adjustment (manual version). Packaging Details: Pallet and Box packing.